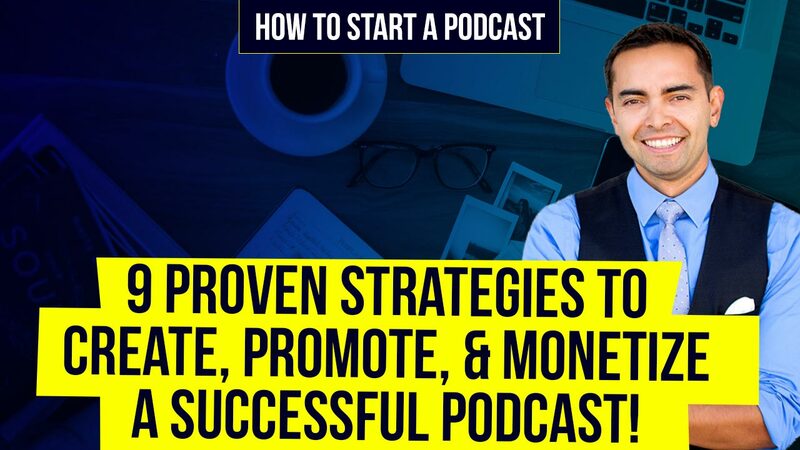 HOW TO START A PODCAST 9 Proven Strategies to Create, Promote, & Monetize a Successful Podcast! Are you looking to start a podcast, but have no clue where to begin? Or are you already podcasting, but looking to get more listeners and subscribers, with proven ways to monetize your show? If so, not only are you in the right place... you’re here at the perfect time! Because podcasting is hot, hot, hot...and it’s getting hotter each and every year! Which means if you want to leverage an insanely engaged platform to grow your brand, your audience, and yes your income....this is the perfect place and time. 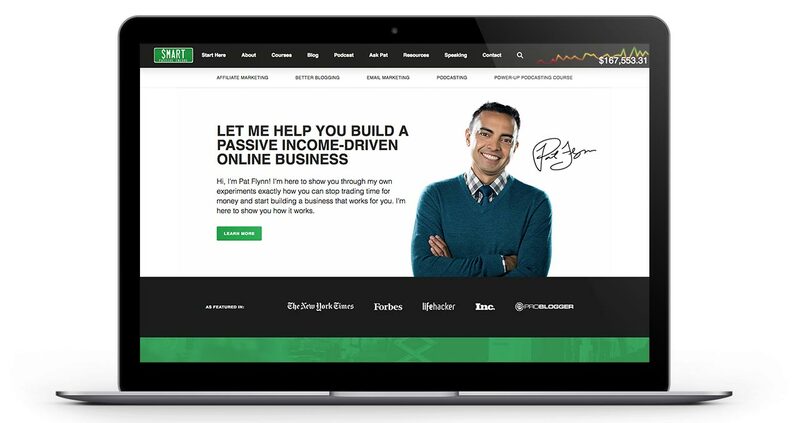 If you’ve been paying attention to the internet marketing world, then you’ve likely heard of Pat Flynn and his brand. Pat is a renowned blogger and podcaster, and has had over 65+ Million downloads to his own podcasts. He currently runs 5 podcasts of his own, and has had top names such as Gary Vaynerchuk, Tim Ferriss, and many others as guest to his podcasts. His podcasts are changing lives daily, and even more importantly for YOU, changing the lives of the students he teaches this stuff to! Very few times in your life do you get to see a new marketing medium growing right before your eyes. But that’s exactly what’s happening with pod casting. There’s over 500 Million blogs online.. There are over 500 Million Youtube Channels. Podcasts: Only 676K in existence! On average people are subscribed to 7 different podcasts. People who love podcasts REALLY love podcasts. 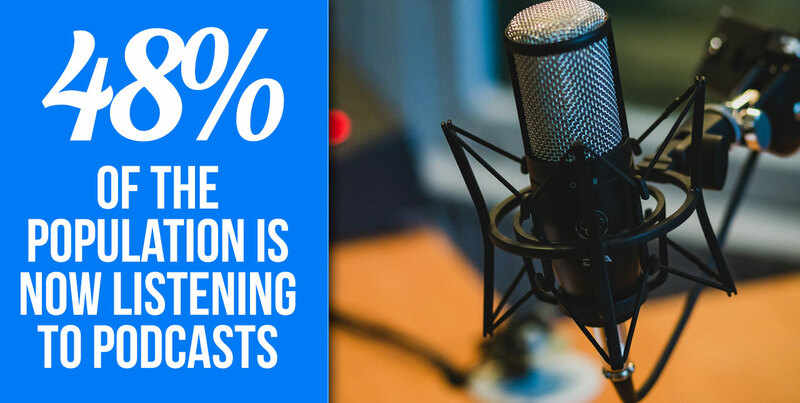 Even more impressive is that people listen to 30 minutes PLUS when it comes to podcasting. Compare that to blog content where they spend only 5 to 10 minutes; YouTube videos where you're doing great if you get 5 minutes (average 3 to 5 minutes); and social media gets a measly 1 min of engagement time. In other words, Podcasts when BIG when it comes to engagement! 30 minutes is a long time to have YOUR brand in front of your audience, where they're listening to you with nearly undivided attention. Your listeners will be engaged with your voice and your content while driving, on runs, walks, etc. Here at MLSP we talk a ton about creating know, like, and trust. With this type of engagement, you’re definitely solidifying that in a huge way! Not to mention, you can use what you're about to learn even to simply be a great guest for a podcast show. Which in itself can help build your brand to new heights. You know about podcasting, and you know you NEED to do it, but just haven't gotten around to it yet! OR...You're a podcasting pro, but you could always use a few more tips. No matter where you fall on the above, you’re definitely going to get a ton from this post. How to get heard from Day #1 when you start your podcast! Ways to differentiate yourself from those around you in the same space! Secrets about the iTunes algorithm so you know how to rank! Monetization tactics (other than advertising) including an episode that has generated over $50K in affiliate revenue, and another that generated over $150K in course sales! How Your Podcast Will Help You Grow Your Brand! Here’s the thing. You might be thinking that you won’t have a big enough audience to get started with your podcast. But let’s break that down a bit. Pat describes having a podcast as like having a live stage...every week! What if you were on stage at a local event, and only 30 people were in a room just to listen to you. 30 people is still quite a bit if you imagine that many bodies in front of you. You might not have a huge audience in the beginning (in fact you probably won’t), but your podcast begins to grow in increments. 30 people listening live will begin to grow to more and more. Lets not forget that these podcasts will be available as downloads from people who don’t show up LIVE forever. So what if you only had a 1000 downloads per episode? Just imagine 1000 people in a room, every week, listening to your presentation. There just for you, with NO distractions. This is content that lives forever on various platforms, available for download. In fact Pat Flynn still gets 1000 downloads per month on a podcast that he hasn't done a new episode of in 3 years on the topic of Food Trucks! This was just a test niche for Pat. Then there’s his Smart Passive Income podcast which gets 115,000+ downloads per episode. That might seem far off for you now, but it could happen faster than you might imagine with what you’ll find out as you keep reading! Remember podcasting is one of the most intimate forms of consumption that you can engage your audience in. While listening to you, your audience doesn't care about anything but your message at that time. That’s powerful stuff! SPECIAL LIMITED TIME OFFER Power Up Podcasting with Pat Flynn? Advanced ways to be an effective interviewer and get your guests to open up! Call to action strategies to convert more listeners to leads and sales for your business! How to find YOUR competitive edge and stick out from the crowd in your niche! How to Build Massive anticipation for your launch event and GO BIG on launch day! Ways to maximize your advertising income and finally earn what you deserve! 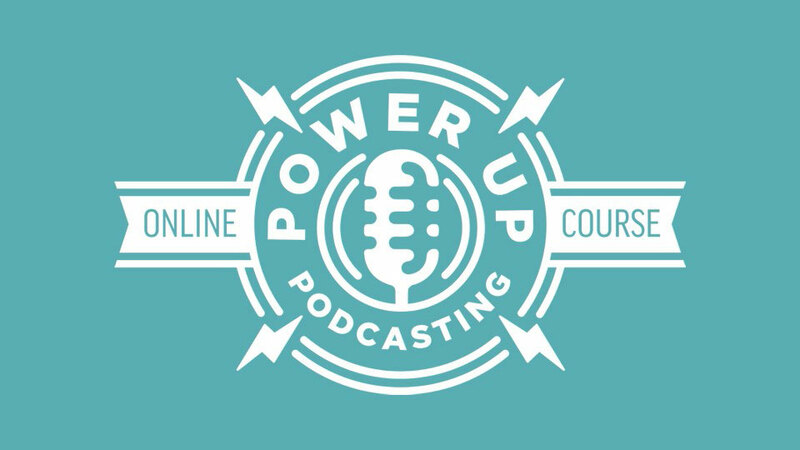 GET POWER UP PODCASTING TODAY FOR A LIMITED TIME! You Have to Be a Natural Born Speaker, Storyteller, or Interviewer! This will be the biggest sticking point for most people. It’ll kill your podcast dreams before you even get started. Are you worried about how people will respond to your voice. You wouldn’t be alone. In fact Pat Flynn himself had the exact same fear when he first got started. He was simply scared to put his voice out there. He wasn’t sure how people would respond, and to him it just seemed like more of a serious undertaking than blogging. With blogging you feel like you can hide your voice through text. Funny enough, after finally getting going, the only person who ever said anything bad about his voice was PAT himself! Once he did that first show, and got his groove after a few shows in, he wished he’d started much sooner. Now podcasting has brought his income to $7-Figures. No telling how much money waiting cost him. Even Pat’s own 9 year old son has gotten into the podcasting game. Yes 9 years old. YOU can do this! Always dreamed of getting on stage? Podcasting actually acts as a great level-one jump toward speaking. In fact these days, conference directors will actually check to see if you have a podcast to decide whether or not you can keep an audience engaged. YOU are enough right now to get on the mic and start talking about any subject you’re passionate about! This is absolutely not true. In fact you’re actually better off the more narrow your niche is, so that you can quickly begin to stand out from the crowd. For instance Phil Lichtenberger Jr. has a broadcast called ‘Scanner School’! All about using police scanners. He’s now got a loyal fanbase of scanner “nerds” who follow him and listen to all his podcast episode. There are tons of examples of this in the podcasting world! You Have to Already Have an Audience Before You Get Started! This is another myth that will stop you from getting started if you let it. The fact isy...you’re going to build your audience as you move forward. VERY few people start out with a large audience. But plenty have grown huge audiences with podcasts. For example, Sophie Walker started from scratch with zero audience. She’s from Australia and started interviewing moms or soon to be moms about their pregnancy. She now has become the #1 kids and family podcast in Australia. You will grow your audience with consistency! Here at MLSP we know that's not true! Because we teach exactly how to take people from content to an offer. Most people think that the only way you can earn from a podcast is with sponsorships. But all you have to do is study a fraction of the training in the MLSP back office, and you’ll easily see that YOUR options are infinite to earn money. Affiliate marketing, or promoting your own products with podcasting go hand-in-hand! If you’re still looking for easy money, then you might be looking forever. And with the strategies you’re about to learn next, you’ll see just how true that is! COMPANION VIDEOWatch Below As Pat Flynn Goes Over the 5 Myths of Podcasting! How to Sound Like a Pro! If you’re worried about equipment, and think you’ll need to spend a fortune, you’re about to be pleasantly surprised! Of course sound quality is very important in the world of podcasting. You can have the best content in world, but if your audio quality is bad, nobody will listen. While there's a certain standard of audio quality that you must have, it doesn't have to be expensive. You can get started with simple USB microphones that plug directly into your computer. Pat Flynn recommends the AudioTechnica ATR-2100 which will only cost you about $60 to $70! For editing you can use Garage Band for Mac, and Audacity for Windows. Heck, these days you can just do it right from your phone! PODCAST CONTENTHow to Create Compelling Podcast Content Your Listeners Will LOVE! When it comes to your content marketing plan for your podcast, it’s very similar to blogging. The best way is to simply Podcast about what's already proven to work. What is your audience already interested in? You can get a lot of this information in your own analytics. Use Stories that relate to your audience: This can be YOUR story, or other people’s stories. People LOVE stories! Conduct Interviews with guests! When you conduct interviews with influencers, YOU become an influencer as well! COMPANION VIDEOIn the Video Below Pat Flynn Shows You How YOU Can Create Content Your Audience Will LOVE! As mentioned above, interviews are a great way to create compelling content for your audience. It’s also a great way for YOU to associate yourself with the influencers in your niche! When it’s time to begin the interview, you simply make the other person feel comfortable before hitting record.How do you do that? You simply say: "I'm not recording yet, but I just want to say thank you for coming onto my podcast. I want you to think of this as just us sitting in a coffee shop together, and I'm just asking you some questions to find out how you did what you did." This turns the conversation into a comfortable situation right from the beginning. One of the biggest mistakes an interviewer can make is asking close ended questions. Such as: “Did you go to college?" This almost certainly will get you a short answer like yes or no. Instead, say things like: "Tell me about your education when you were growing up and how that affected who you are today"
This will give your guest a chance to expand and go into stories about their past. And people LOVE stories. People connect to stories. Your #1 job as the interviewer is to simply be curious. When you do this, and you get others to open up to you, and it’ll help you stand out from all the other shows. This is a great way to get your guest to go into the kinds of stories that people love. It gives them permission to go into your story. It’s the "Tell me about a time when” that’s the key. Then you can ask more open ended questions to expand from there. And then LISTEN! Don't be so worried about what you're going to say next. Let if flow like a natural conversation so that your listeners simply become a fly on the wall. COMPANION VIDEOPat Goes Into How to Conduct an Interview in the Video Below! How you begin your podcast episode will reflect largely on whether or not your listeners will actually keep listening. Much like a headline, a subject line, and an opening sentence to a blog post, sales page, or email... you must hook your listeners right away. Every episode should start with a hook. You have about a minute to grab them. In that first minute, simply tell them what you're going to tell them (give them the big benefit of what they're about to hear). This will let them know that it’s worth it for them to stay and listen. Another thing that works great is to pop a clip from the middle of the episode into the beginning as a teaser of what’s about to come. This will create an open loop and keep them hanging on to hear what happens next. People love stories, so going right into a story that relates to what the episode is about will grab their attention! A simple phrase like: "Hey imagine this..." is hard to resist. Once you’ve got people locked into their visualization and imagination, you’ve got them where you want them. The key is to take them away from having to make the decision of whether to listen or not. This pulls them right into your episode without resistance. COMPANION VIDEOPat Flynn Goes Into Further Detail of How to Start a Podcast and Keep People Eagerly Listening in the Video Below! Once you've got your first shows up and running, exported, and loaded up, now it’s time to get your podcast heard. The best way to do this is with the same proven marketing that you would use with a launch! Because in essence, you’re launching your podcast! You need to get people excited about it your launch. Give them a reason to show up. The Mistake Pat Made When He Launched His Podcast! When Pat launched his first podcast, he made the mistake of only launching with 1 Episode. He’s found out since that you need to launch with at LEAST 3+ episodes. This will give a person a chance to listen to more right away if they like what they hear. Simply have about 3 subsets of your niche covered into different episodes. This mean you need to pay attention to your cover art of your podcast. Make sure it stands out in your category on iTunes or any other platform you plan to use. If you’re using video marketing then you can consider it like your video thumbnails to grab attention among all the other videos. Not sure what will stand out? Simple. Go to your podcast category and check out the competition. And make something that will stand out! 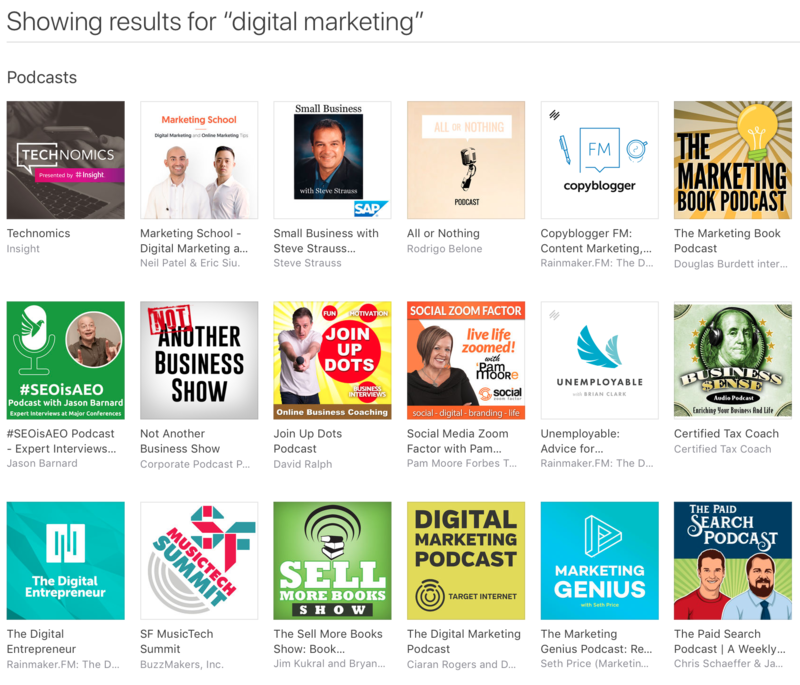 These are the podcasts that show up in iTunes when searching "Digital Marketing"
When you hit all those variables, you get a good chance of landing on the "New and Noteworthy" for your category for 8 weeks! This can pull you in a ton of listeners and subscribers very quickly. COMPANION VIDEOWant to Find Out How to Create a Buzz and Launch Your Podcast in a BIG Way? Watch the Video Below! BONUS TIP! Pat Flynn's #1 Ninja Podcast Growth Hack! Through his podcasting learning curve over the years, Pat has created his unique but proven Ninja Podcast Growth Hack! But the devil is in the details of this ninja trick. Once you find the groups, find the admins, message them, and introduce yourself. What do you say when you message them? "Hi my name is [Your Name], I have a podcast, how would you like to be featured on it? When you do it this way, the likelihood of them saying YES for the opportunity to be on your podcast is very high. Now go to different group admins, and gather about 5 guests, all answering the same question for your podcast episode. When you do this, what are the chances that they will feature it within their group? Very high! Now you're not going into the group as an annoying spammer. You're now being endorsed by the group OWNER! This person is a star in the eyes of their group. Everybody wins! You get access to the group, the admin gets to show off that they were in the podcast, and it also adds massive exposure for the group! Plus you can do this for any type of marketing such as video marketing ,blog posts, your newsletter, etc. A lot of people think that their only hope to monetize their blog is through sponsorships, but nothing could be further from the truth. Don't start by trying to get sponsors. Your chances won’t be very good if you’re just getting started, because you need a LARGE audience to get the attention of these sponsors. One of the best sales strategies in the world is using demonstration. If your a coach or product owner, you can simply do a coaching call right on your podcast. Imagine how easy it will be to persuade people to sign up with you, when you display right in front of them what kind of help they’ll get from you? You can sell other people's products (MLSP affiliate?) right on your podcasts. Much like videos, you can review products, do demonstrations of products, or give a powerful mention of a product, and simply give them your link so they can grab it. This is one of the ways that Pat Flynn monetizes his own podcasts. And it’s worked like gangbusters for him as you’ll see. Create easy to follow "Pretty Links" or Short Links (It’ll be easier to give out your links in a way that your audience easily remember them. Include affiliate links on your show notes page. Think of your show notes as your YouTube description. This is where you can strategically link to your affiliate products. Interview the founder of the product! Ask them to come on and talk about how they started, why they started, etc. Using these tips, Pat Flynn had done OVER $50K in commissions, all from one single podcast episode alone. CONCLUSIONWhat Can Happen for YOU Once You Start your Podcast? The effects of podcasting are bigger than just the money you can make per episode. It’s a way to build a trusted online brand that follows you in all your business endeavors. Podcasting allows you to create a deeper connection with your audience. (No other medium puts you in their ear when they're driving, running, etc.) They begin to feel like they’re your friend…which of course is know, like, and trust at it’s finest! You’ll have the chance to meet amazing people as you connect with influencers. It’ll give you massive leverage to expand your reach and grow a bigger audience for your brand. By doing this you’ll always have a fresh stream of amazing clients coming in, because podcasts are evergreen! One of the great byproducts of podcasting is it forces you to be a better more confident speaker and communicator. Which will help you in every single area of your life! Got value from this post? Have your own thoughts? Think we need to add anything here or just want to give Pat Flynn props?